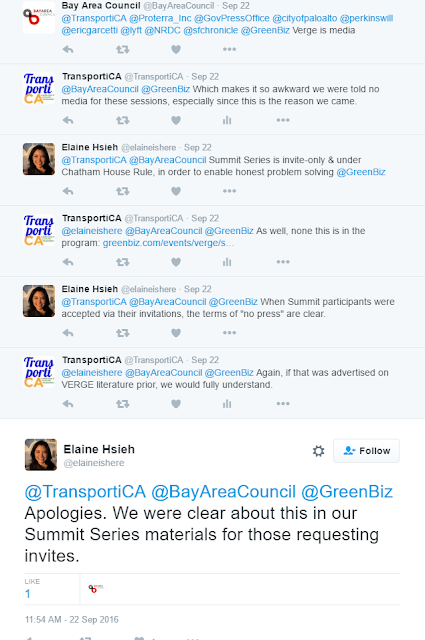 Last month, TransportiCA covered GreenBiz’s annual VERGE conference in Santa Clara (19-22 Sep). This was TransportiCA’s first time covering this event, but our editorial board was more than aware of VERGE and GreenBiz, principally through our graduate scholarship in transportation, business and public administration. TransportiCA is well-aware the term “sustainability” has become integral in the global lexicon. However, we fear its overuse - not accompanied by a proper foundation and accompanied by financial interests - brings it in the area of green-washing. As noted on our “About TransportiCA” page, we believe the best denotation of sustainability is based on the integration of John Elkington’s “Triple-Bottom Line,” also casually referred to as “people, planet, profit,” or the "Three E's - Economic, Environmental and Equity." Sustainability can only be achieved when the integration of financial operations, environmental impact and social equity has been examined fully. 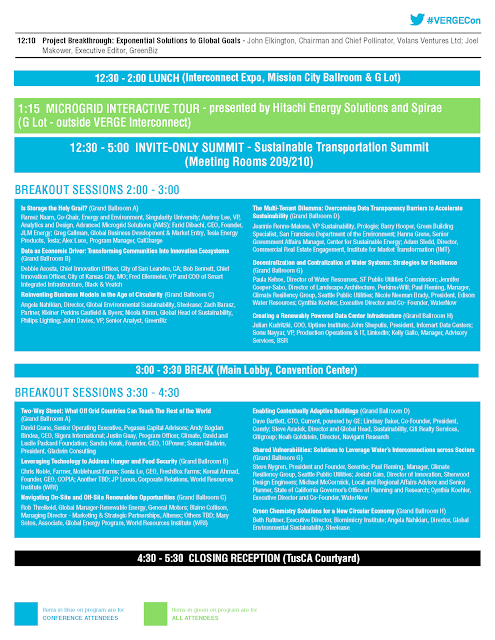 Despite not presenting a definitive sustainability construct, we pressed on, looking forward to cover the “Sustainable Transportation Summit” on Thursday, 22 September. As required in the program, we electronically submitted attendance requests. But by Thursday morning at 11:00–ninety minutes prior to the summit, we had not heard back. When we went to the registration booth to inquire as of our attendance status, a volunteer informed us that summit was closed to media. We thought this was strange, since VERGE is a media organization, so we asked for a supervisory response. We were told the same thing. Frustrated about the fact the Sustainable Transportation Summit was a major venue for TransportiCA’s coverage, we sent the following tweet. Following that tweet, Bay Area Council replied, and we responded. So, TransportiCA was informed this was in the summit materials, and only if we had been accepted to attend, would we have been privy to such details. Again, this was not mentioned in the any of the official program materials prior, to which we would have tailored our coverage schedule, if so. Below are some of the materials, and their links provided when clicked on. From this occurrence, TransportiCA has expressed three major concerns about the summit, not taking into account the possibly important and pivotal information discussed in the summit, but now remaining to the confines of attendees. 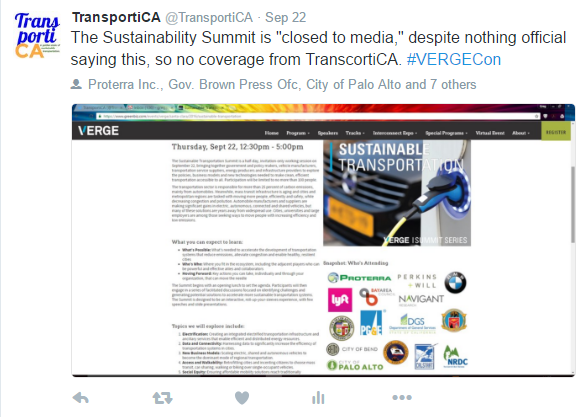 First, TransportiCA is saddened a media organization chose to bar other media outlets, especially given this is an issue VERGE and GreenBiz otherwise work hard to proliferate among their following, and within the “sustainable” business community. TransportiCA’s editors attended journalism and communication studies, and have degrees in such; shutting the door on other organizations was not something we were educated in. Further, in this time of declining media resources, organizational partnerships are more than needed for sheer survival. Second, like pure privacy and the convictions it once protected, the days of the Chatham House Rule are over. Twitter, mobile phones and other portable transmission devices have ushered-in a time of no such privacy; while in spirit, the rule is noble and chivalrous, but today’s innovative, yet clandestine-like devices have relegated the Chatham House Rule to the annals of history. If the U.S. government can record Chancellor Angela Merkel’s phone calls and capture her texts, we are confident the ability to transmit summit opinions expressed in that room can, and probably did take place. Lastly, the fact that a closed event attracted so many public officials is, in all honesty, disturbing. As mentioned before, TransportiCA’s editorial board contains former county, state and federal employees. We are a generation of public servants raised with the Brown, Public Records, Freedom of Information (FOIA) and other legislative transparency acts; these principles are ingrained in our mindset and work ethic. We all have also bared witness to the fallout and embarrassment non-compliance brings. We are completely aware the VERGE conference is a private event, not funded, nor administered by other public agencies. However, the concept that suppression enticed many public officials to attend the summit is disheartening to us. We are also discouraged so many public entities were involved: the cities of Los Angeles and Palo Alto, California Energy Commission, Department of General Services and even Governor Brown’s office. 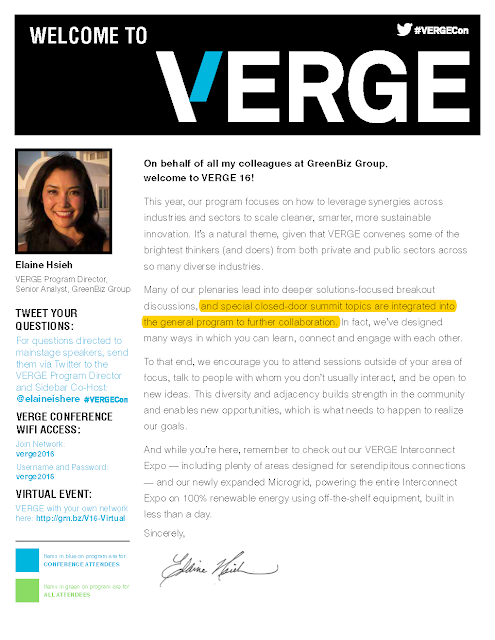 In the end, with VERGE’s and GreenBiz mission hoping to proliferate measures of sustainability–whatever that concept/construct may be, we have to ask: who or what is exactly served by these closed-door summits, and how will sustainability, overall, ever be furthered by such silence? As always, your thoughts are more than welcome, and GreenBiz is provided the chance for response. TransportiCA represents the views of the Editorial Board, and no other organization or legal entity. Powered by Blogger.